How long did you serve in Eulex? What was your role in the mission? I served in Eulex from the beginning of the mission, in December 2008, until the early spring of 2011. I was a criminal judge at the district-court level in the town of Gjilan/Gnjilane in the southeast of Kosovo, one of the five district courts now active there. Quite often, however, according to the mission's needs, I also served in the Pristina district court. What were the major challenges you had to face during your mission in Kosovo? My job in Kosovo was a mixture of pure judicial work and the work of a mentor. Eulex, in fact, has two main goals: from one side to assist the local judicial authorities acting in the framework of the so-called Monitoring Mentoring and Advising (MMA) mechanism, while on the other side to retain pure judicial powers, having jurisdiction on a certain number of cases. This second part was more natural for me, because I used to serve as a judge in my own country, although there were difficulties in learning the local legislation and complying with local jurisprudence in case it already existed, since in quite broad areas, there is literally no previous jurisprudence. To learn, understand and then to apply local legislation wasn't an easy task. I would say, however, that the biggest challenge was the MMA, because in Kosovo we work in a completely different cultural and historical framework, not to count the language barrier. How do Eulex judges and prosecutors interact with the local judicial system? Born in 1967 in Sofia, Dragomir Yordanov is currently the Director of the Bulgarian National institute of Justice. After obtaining a Master's Degree in Law at the "St. Kliment Ohridski" University (Sofia), he specialised first in France and then in the United States. As a judge, he worked in the Sofia City Court and Regional Court. From 1999 till 2004 he was the director of the Magistrates’ Training Cente. Dragomir Yordanov worked for Eulex in Kosovo from 2008 till 2011. We were deployed, and served, as part of the local courts, which means we used to work in mixed panels, even if panels could be composed exclusively of international judges. The clear mission strategy, however, was to have mixed panels, and especially in recent months to have a majority of local judges in them, as part of the MMA strategy for mentoring local judges through common work in court. One of the big critiques against Unmik was that, at the time, there were two parallel judicial systems, the international one and the local one. I think that the fact that Eulex judges and prosecutor work together with local ones is extremely positive. 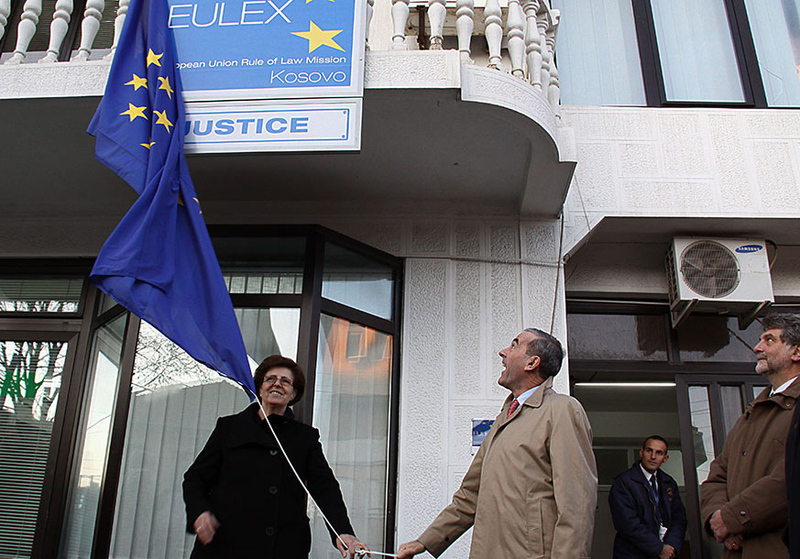 Eulex (and the European Union as a whole) has not recognised Kosovo as an independent and sovereign state. How did this influence the activities on the ground and your relationship with the local institutions? I wouldn't say this had a clear impact on the operations of the mission, since the EU member states unanimously decided to deploy Eulex. There are, however, elements of uncertainty regarding the applicable law in Kosovo, which resulted not only from the EU position on the independence of Kosovo, but on the overall uncertainty on Kosovo status. In terms of applicable law, in many cases the old Yugoslav code was active when the criminal offence was committed. In many areas, for example in civil matters, there is still nothing but the Yugoslav code. We also have to consider the series of Unmik regulations on the judiciary. Then, after the proclamation of independence of Kosovo, the Pristina national assembly started adopting its own legislation. Therefore, we face the question of which legal order, which legislation to apply, especially when they differ. This dilemma emerged primarily from the uncertainty of the Kosovo status, and the lack of an internationally shared solution to the question. EULEX is currently the largest international mission of the European Union. Contributing states: Most EU member states as well as Norway, Switzerland, Turkey, Croatia, the US and Canada. Others could join. To put it in practical terms, are Eulex judges expected to apply the laws now passed by the Kosovo national assembly or not? The choice is given to every single judge, which legal norms to apply. In strict legal terms, this is the correct solution. The problem however, is that even if the mission has a “neutral status” regarding the independence of Kosovo, by choosing to apply one or the other legal provisions, Eulex judges are de facto put in a position to implicitly or not recognize Kosovo's new institutions. If a Eulex judge decides to apply legislation voted by the Kosovo parliament, that implicitly means the judge recognizes the legitimacy of the legal order originated by Kosovo's declaration of independence. This debate is still ongoing, also because the high possibility of conflict between different laws in Kosovo. The question has arisen several times, and Brussels is very well aware of the problem. A clear solution, however, can be given only by political means, but apparently in the near future this answer will not arrive. Isn't this a paradox, the fact that people do not know in advance which laws will be applied to their cases? The law is a function of sovereignty; only the sovereign can make laws. Therefore, once more, we go back to the political question: is Kosovo a sovereign country or not? We must first answer this question, if we want to answer your question. We do not have to forget, however, that in Kosovo, on the ground, there is a strong demand of justice. People of Kosovo want justice. In practical terms, a huge amount of cases and criminal offences still need to be prosecuted and judged. Moreover, this cannot wait on a decision as to which code is applied. Eulex works in a delicate situation: on the one hand, it has to cooperate with the local political elite; on the other hand, it is asked to fight corruption of the same political elite. Isn't this a contradiction? Yes, in a way, it is a contradiction, but not bigger than what happens in other countries. Fighting corruption elsewhere also means public authorities must prosecute other public authorities, whether in the executive, or in judicial or in the administration. Perhaps the degree of contradiction in Kosovo is a bit higher, since investigations are conducted by international prosecutors and judges. When I left the mission, however, several investigations were pending against high officials such as ministers, parliamentarians, mayors of big cities. Moreover, there have been several convictions. Of course, there were moments when you could feel this was a delicate matter. Sometimes local judges were very reluctant to be involved in this kind of cases. Nevertheless, this is also why international judges and prosecutors are there. In addition, at least in verbal political statements, the government of Kosovo always showed cooperation in these sensitive investigations. Together with its judicial agenda, Eulex also has a political one. Did you ever have the impression that they conflicted with each other, especially when investigations involved “sensitive” political figures? In my personal experience, in Kosovo, I never faced a situation where political pressure was exercised over a judge. Of course, the political environment is very sensitive. We had cases in our district that involved high local officials, and they clearly obstructed justice, but nonetheless the judicial proceedings were conducted to the end with the assistance of local authorities and thefull backing of our mission. Eulex officials have a limited stay in Kosovo. Do you think this time framework represents a limit to the effectiveness of their job? From the perspective of a judge, I think that a longer mandate would have more advantages. First, because we have to learn or adapt to the local legislation and although a lot of materials is available on the internet, this knowledge can be truly gained by working on the ground. To start to work effectively takes several months. Of course, this also depends on the “legal culture” of the various judges and prosecutors, since the members of the mission come from countries that have different legal traditions, and some are more similar and others quite different from the one(s) now active in Kosovo. What kind of “juridical philosophy” did Eulex introduce in Kosovo? Kosovo, belonging a long time to Yugoslavia, was also part of its legal system and legal culture, which used to be a “continental” legal system. In the last years, there is a clear tendency to make the system more adversarial, and to introduce many elements from the common-law system in Kosovo. Some of them were well designed and well adapted to Kosovo traditional legal framework, while other ones still face difficulties in being well interpreted and applied, especially by the local judges. There have been discussions also among Eulex judges, especially among the one coming from “common law” countries, and the one coming from “civil law” countries. Their discussions are not on the interpretation of the law, but namely on the philosophy that lies behind it. How did this new philosophy interact with the traditional local legal culture? The interaction, of course, is not always easy. For example, let's consider detention on remand. In Kosovo, there is a clear trend for local judges to largely use, and sometimes abuse, this procedure. However, when discussing the matter with local judges, it came out that sometimes defendants are put in detention on remand simply to save their lives, to save them from the revenge of the family of the victim and to give some time for the families to reconcile. We monitored several cases when, after reaching a private agreement, the defendant admitted his responsibility. In Kosovo, there is a local, non-written, non-official tradition to settle the conflicts through negotiations between the two or more involved parties. This tradition, however, is sometimes used also as an argument in court. In the Gijlan district, for example, there was a murder case in which the defendant claimed to be innocent. Nevertheless, once in court, the prosecutor raised the argument: “If you're innocent, why have you sent a mediator to the family of the victim?” For the public opinion, that was a crucial argument, even if not in line with the “official” legal provisions.